Will Stop for Garage Sales! 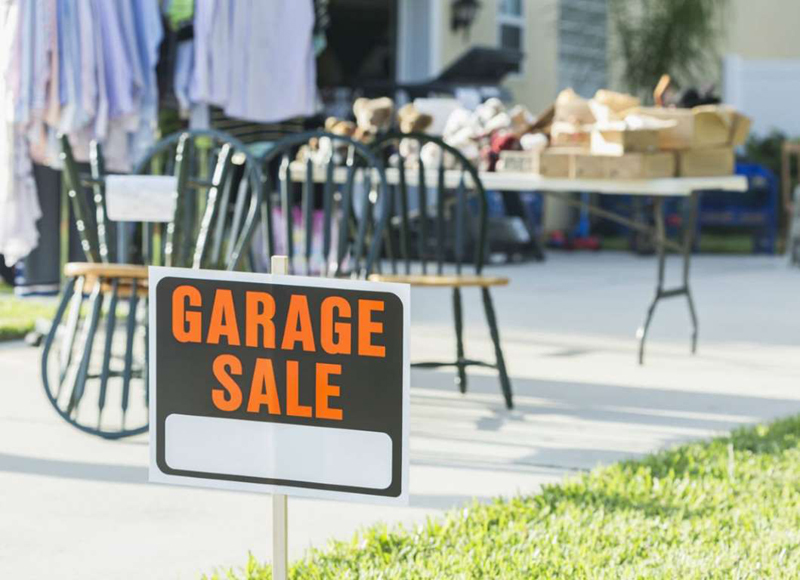 It’s no secret that garage and yard sales can be a fount of hidden gems at bargain prices, but often the things you find are more "shabby" than "showpiece." 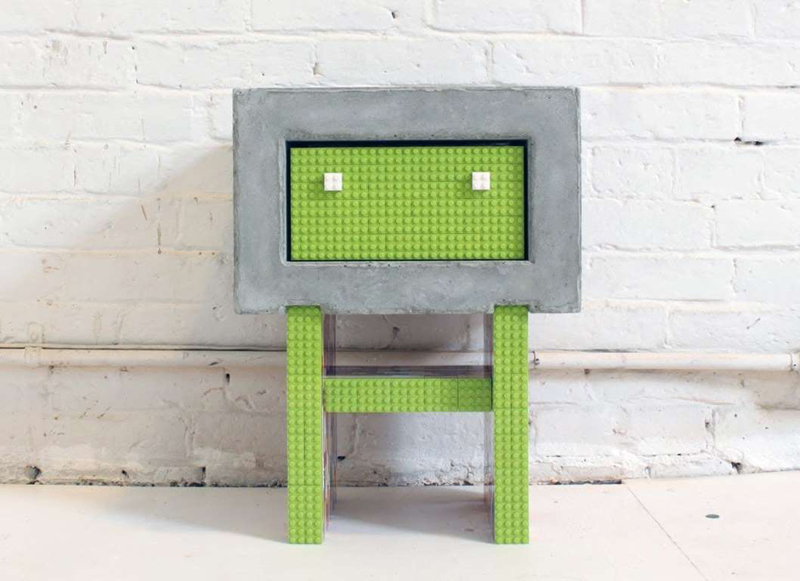 Fortunately, imaginative do-it-yourselfers can upcycle secondhand stuff into truly high-end home furnishings and accessories simply by adding concrete to the mix. 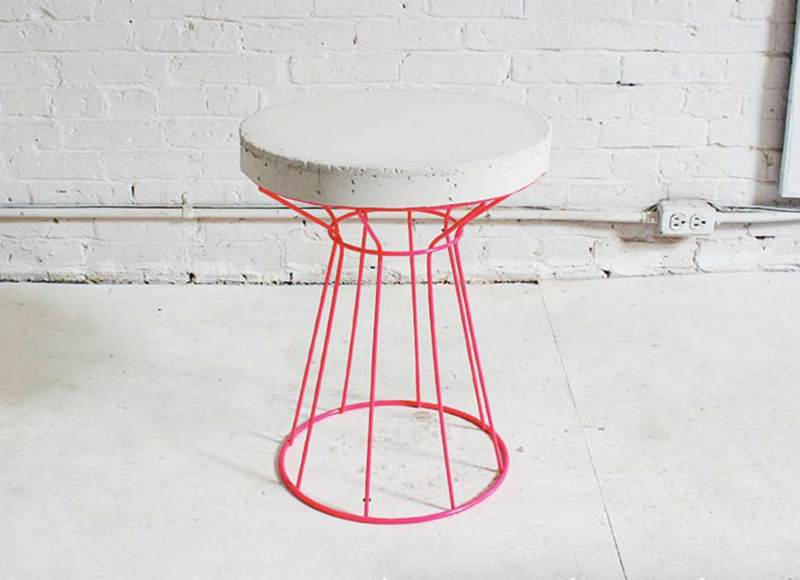 The trick is using an old item as a mold, base, frame, or other scaffolding to create something totally new. No worries about overspending on this type of project: You're bound to find a steal at the sale, and a 60-pound bag of Quikrete 5000 Concrete Mix costs less than six bucks. And, because concrete is so durable, your sleek, modern masterwork will really last. New to the concrete scene? The folks at Quikrete have plenty of tips on mixing and casting to help you create with their remarkable material. So, check out some of the transformations other DIYers have achieved, and start turning your garage and yard sale scores into pieces you’ll be proud to show off! Use a cut of the melamine and a pair of dog bowls to fashion the mold for a cool canine feeding station. Mix up some Quikrete 5000 and fill the mold, then insert four rubber furniture pads at the corners—these will raise up the final product and prevent it from scratching the floor. 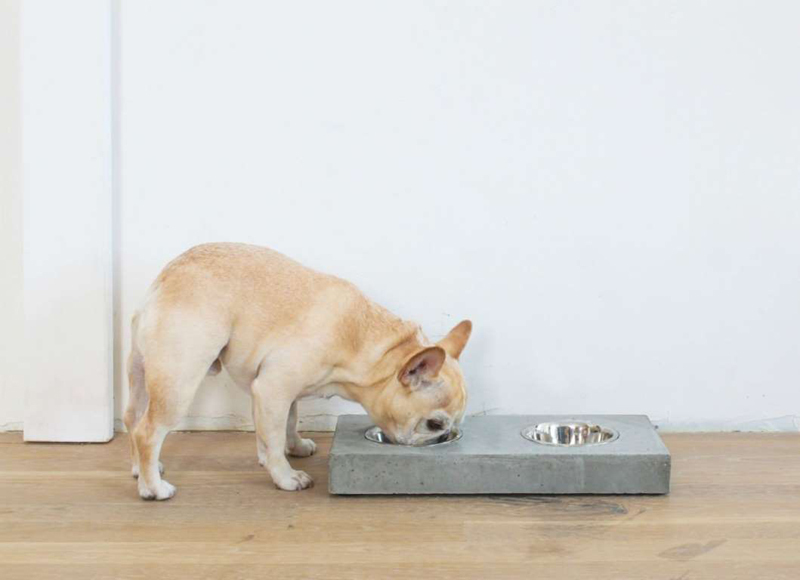 When the concrete has cured, it’s ready to be unmolded and filled up for Rover’s mealtime. Come and get it! 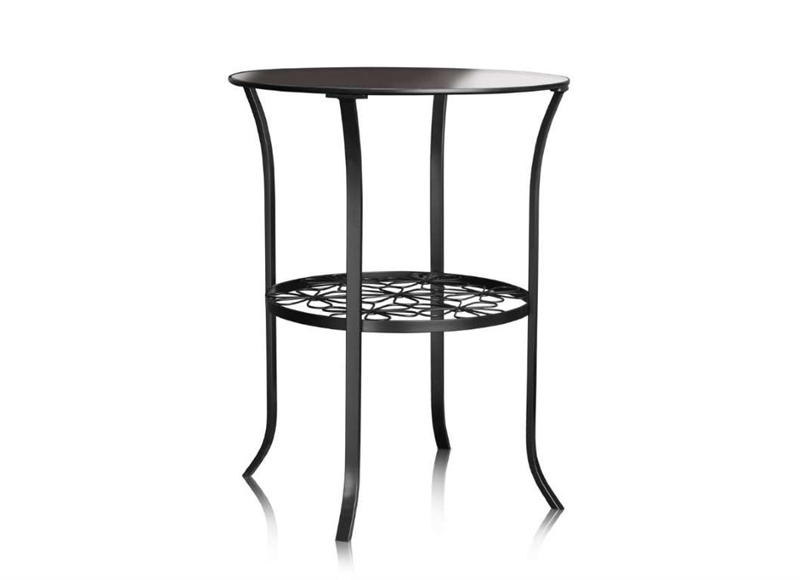 Few can resist scooping up a side table for spare change, but it’s a letdown when you realize later that the top is thoroughly trashed, skimpy, or just plain cheap-looking. You could chalk one up to buyer’s remorse and toss it—or give it an easy makeover that’ll truly suit your style. To make this chunky tabletop, grab some four-inch-wide vinyl base trim (available at flooring retailers for about $3 for a four-foot length) and attach it to the original plastic or melamine tabletop with screws, then seal the seams with duct tape. Mix and pour in Quikrete 5000, tapping the mold all the way around to vibrate out any air bubbles. Remove the vinyl after 24 hours, screw the concrete top onto the frame, and—ta-da!—you've got yourself a basically brand-new table. 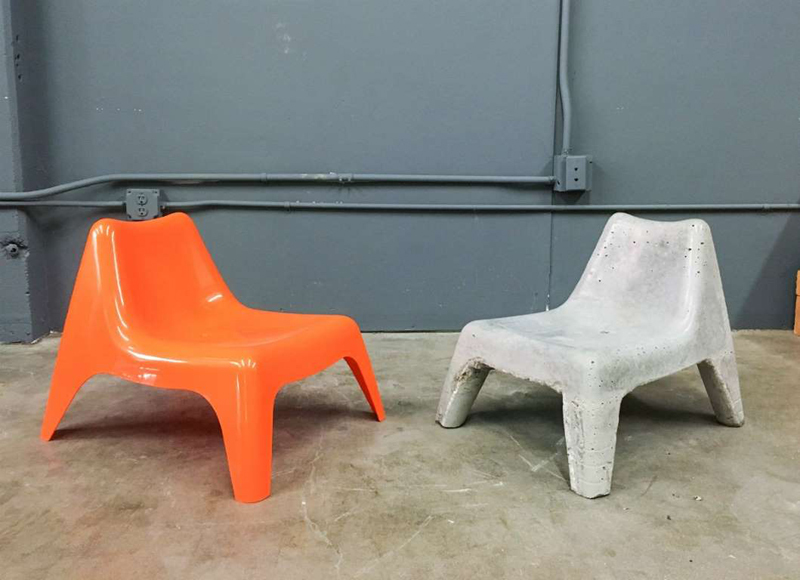 Turn a plastic chair upside down, prop it up on blocks so it’s level, and—presto!—it’s a mold for a killer concrete seat. 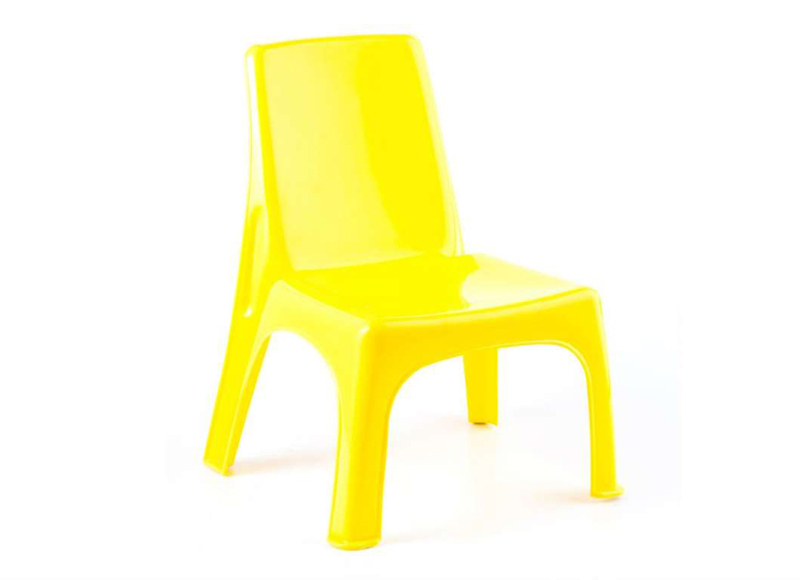 This project works best when the plastic seat is designed to stack—its edges will curve slightly to help hold the concrete, leaving you to improvise the remainder. Cut the tops and bottoms off four plastic bottles, and duct tape them to the legs. Once you’ve filled the mold with Quikrete 5000, sit tight for about two days, then score the mold with a circular saw (being careful not to cut all the way through). This will weaken the plastic so you can break off the mold. How’s that for sitting pretty? Countless kids go through a serious Lego phase, then abruptly give it up for other passions. That’s why you so often see those small plastic construction bricks at yard and garage sales. Of course, you have no use for them—or do you? Legos snap together easily for all kinds of concrete projects. For this whimsical nightstand, build two four-sided rectangular forms, brick by brick, with one form nested inside the other. Glue them on top of a piece of laminate board. Fill with Quikrete Countertop Mix (which has a finer grain than regular concrete), using a stick to push the concrete down into the corners, and let it set. 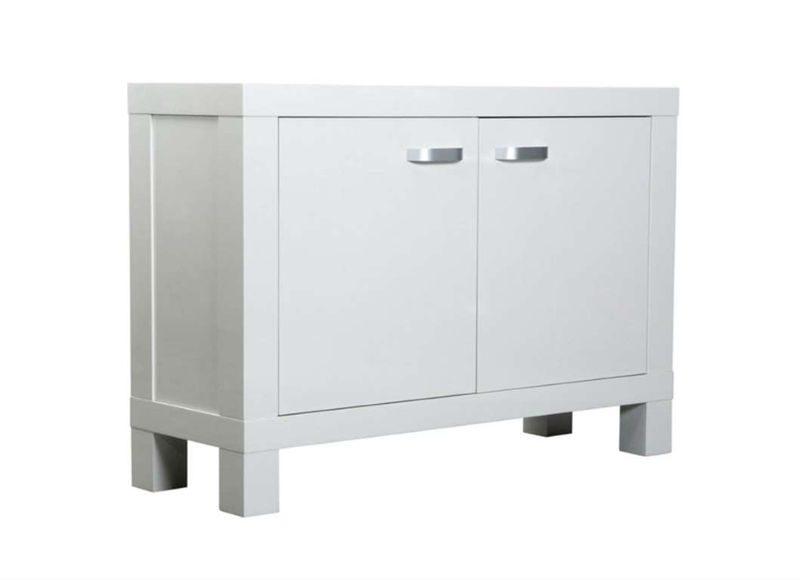 Meanwhile, assemble Lego legs and a drawer to finish your nightstand. Pleasant dreams! The best part? Your leftovers are reusable! 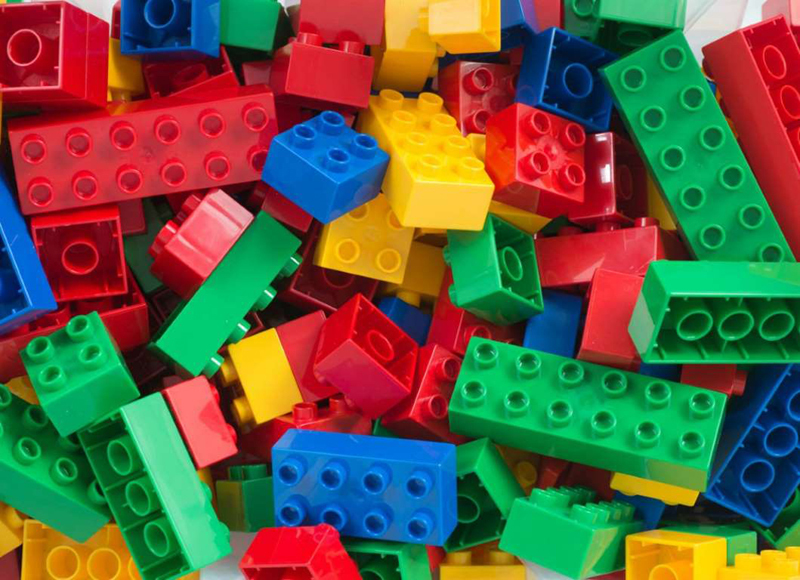 After assembly, run the concrete-covered Legos through the washing machine in a mesh bag to prep them for the next build. 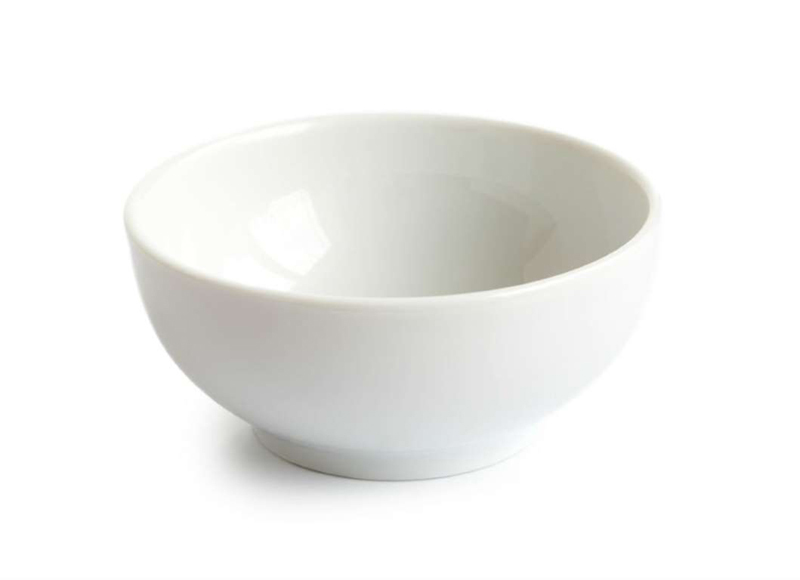 Tableware is a yard sale staple, especially ceramic bowls. You probably won’t find complete sets, or maybe the pieces look a bit worse for wear. So who needs them? You—if you have a light-bulb moment! 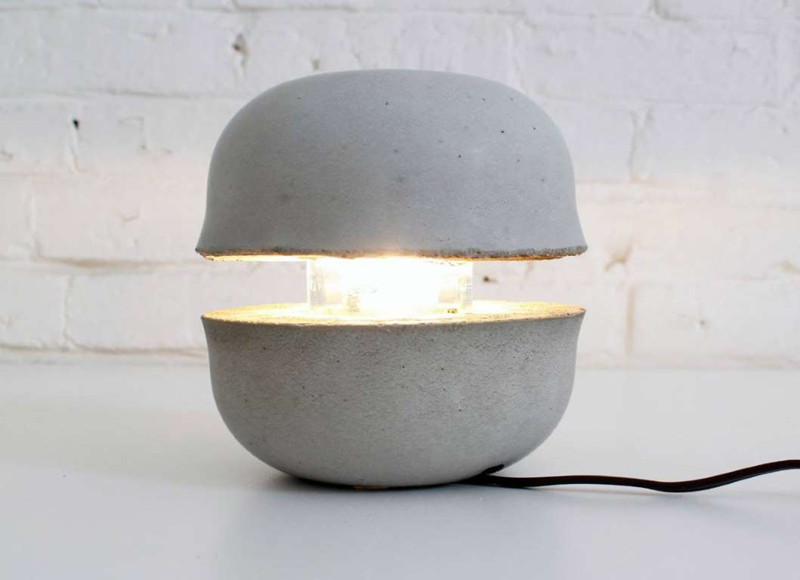 This rounded lamp is too hip to be square. To make one, hot-glue a glass jar, lid side down, to the bottom of one bowl that you’ll then fill with Quikrete 5000 concrete mix. Let it cure and remove it from the mold—this will be the base of the light. Fill a second bowl with concrete to serve as the top. Turn the lamp base upside down so that the protruding part of the jar sticks into the wet concrete. Use two equal-size pieces of wood as spacers to suspend the base in place. Once both pieces have cured, thread in an electrical cord with a socket, and let there be light! Cabinets that are past their prime are bound to appear on neighborhood lawns at “steal me!” prices. The last thing the owner wants to do is drag those items back into the house. So how can you turn their trash into your treasure? A big planter can cost big bucks, but you can make one for mere pennies! Glue stacks of rigid foam insulation inside the stock cabinet, then drill a hole in one wall and insert a pipe (important for good drainage). Fill to the brim with mixed Quikrete 5000. 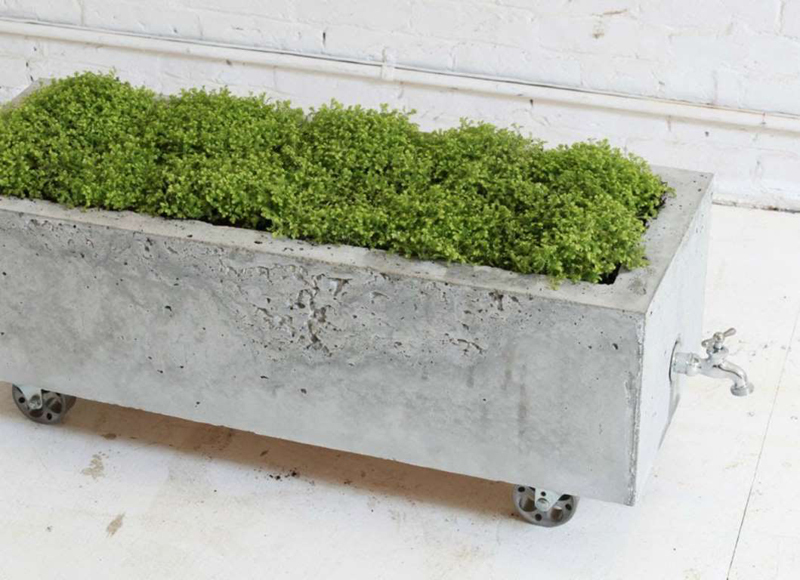 When the concrete has set, remove the foam, screw a spigot onto the pipe, and add wheels if you want your cool concrete planter to be portable. 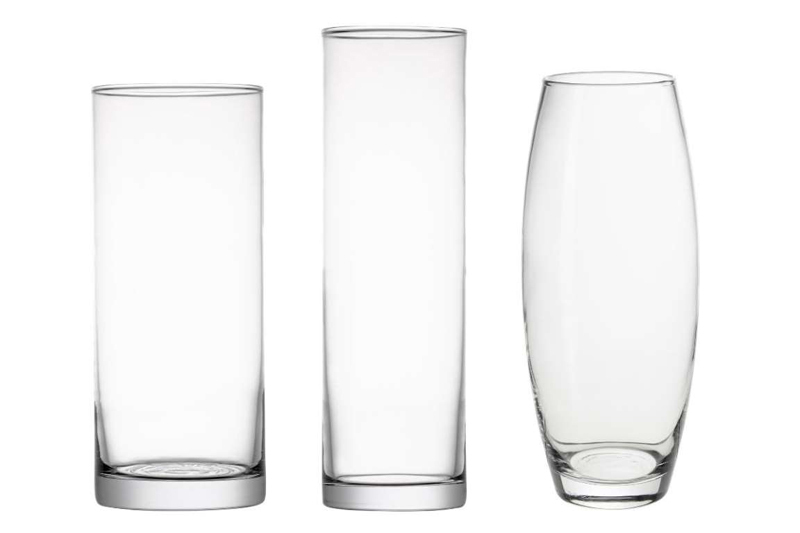 You love the look of that tall glass vase someone is virtually giving away. But it’s not the most practical purchase; what you really came for is a lamp. You start to walk away—and then you get a flash of DIY eureka! 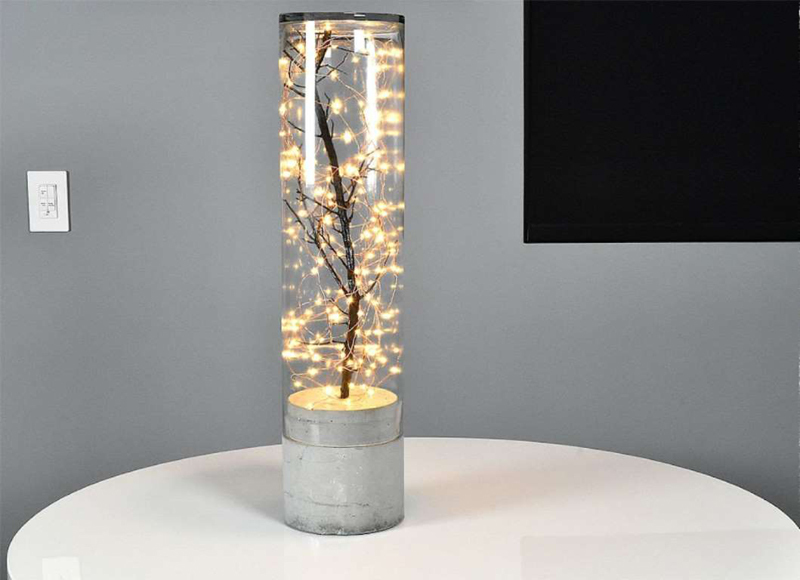 To re-create this tree-mendous lamp, make a cylindrical form for the base out of packing foam and metal flashing (which sells for about $17 for a 10-foot roll), then fill it with concrete. While the concrete sets, search for the perfect dried tree branch and spray-paint it the color of your choice. (You’ll have to do a bit of drilling in the concrete base to hold the branch in place and attach the power plug.) Put the branch upside down in the glass vase along with the string lights, then fit the vase onto the base, working the branch into the support hole. 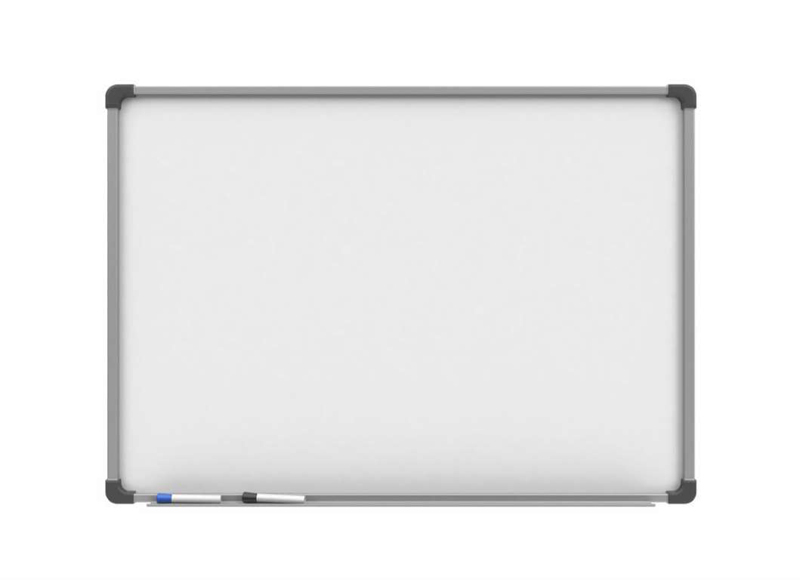 Give it a flick, and bask in your brilliance. Looking for more light-bulb moments?